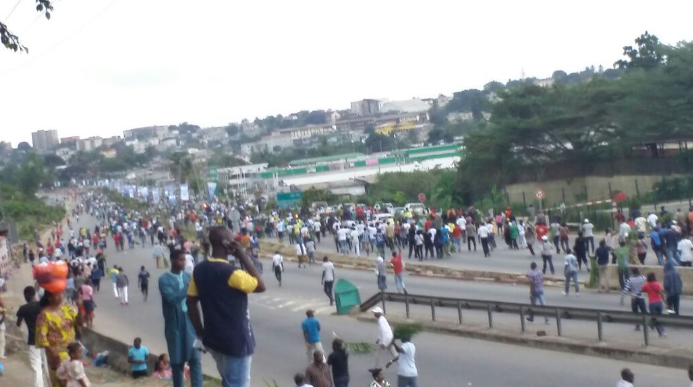 Citizens gathered in Libreville, Gabon on August 28, 2016 to demonstrate before results were announced. Photo by Peter Penar (@PPenar) via Twitter. The government of Gabon blocked access to the Internet shortly after protesters began contesting results of recent presidential elections in which incumbent President Ali Bongo appears to have won by a narrow margin. Hundreds of people were also detained during demonstrations over the election results, following allegations of election fraud by the opposition party. The shutdown followed reports of throttled bandwidth and limited access over the weekend, and persisted for five days. Internet outages were observed on the 29th and 30th of August and the 1st of September. We have been in contact with civil society organizations to train them in using tools to circumvent internet censorship. We are working with many international organizations that have implemented simple tutorials to develop these tools. So the internet still works. Unfortunately, not all Gabonese people can use them [the tools]. So far, only users who have in-depth technical knowledge can use them and therefore they are the catalysts for all content coming out of Gabon. So today, it is with some of these accounts that we are in communication. Jailed Algerian columnist and blogger Mohamed Tamalt has entered a coma after two months on hunger strike. Tamalt began his strike in late June to protest his arrest and imprisonment by Algerian authorities. He is serving two years in prison for allegedly insulting the country’s president in his reporting, which centers on issues of corruption and the role of the army in political life. A Mauritanian blogger is facing a death sentence for writing a blog post critiquing the use of Islam to justify a caste system. His sentence was confirmed by a Court of Appeals in April upon re-examining the case, but human rights campaigners are hopeful the Supreme Court will issue a more lenient sentence. For the first time, a Bhutanese journalist is facing defamation charges over a Facebook post. The post in question was about a property dispute between a Bhutanese family and businessman Ap Sonam Phuntsho, which Phuntsho claims caused “irreparable damage” to his reputation. Burundian journalist Jean Bigirimana has been missing for over seven weeks, though he is believed to be in government custody. Bigirimana writes for the independent news site Iwacu, which is one of only a few free media outlets in Burundi’s tightly controlled media environment. Among other things, Bigirimana wrote about the lives of exiled Burundian journalists living in neighboring Rwanda, which has tense relations with Burundi. Both Iwacu and Bigirimana’s wife are working to raise awareness of his disappearance and advocate his release. Security researchers Claudio Guarnieri and Collin Anderson uncovered a campaign to compromise the communications devices of Iranians using a technique known as “spearphishing” along with remote access tools, which allow attackers to break into and use a person’s computer or mobile phone from afar. One of the techniques involves an adversary posing as a human rights organization (such as United for Iran) or US immigration services and sending email messages containing embedded malware. Another attack compromised over a dozen accounts on the widely used messaging service Telegram and identified the phone numbers of 15 million Iranian users, the largest known breach of the messaging service. The French telecommunications company Orange may soon purchase stock in cellular operations in Iran. The Wall Street Journal said this would be the first western company to do so since sanctions were lifted, though it should be noted that South Africa’s MTN at one time owned 49% of Iran’s third largest mobile carrier MTN Irancell. There is still little publicly known about Orange’s talks with the Telecommunications Company of Iran, which is owned in part by the Revolutionary Guards, a body responsible for the surveillance and imprisonment of many activists, journalists, and political prisoners. The Telecommunications Company of Iran is also designated as a terrorist organisation by the US government. The United States Federal Trade Commission filed a complaint against Facebook’s plans to harvest phone numbers from its WhatsApp messaging services. The complaint accuses Facebook of engaging in “unfair or deceptive acts and practices” — WhatsApp committed to its users not to provide user data to Facebook when it was acquired by the social network, with WhatsApp founder Jan Koum assuring users that “privacy is coded into our DNA.” While the FTC investigation continues, users have until September 25 to opt out of the data-sharing agreement. A step-by-step guide to doing so is available here. Will news publishers cash in on the EU’s new copyright rules? Under proposed new changes to the European Union’s copyright rules, national laws soon may be passed requiring news publishers to claim payments from news aggregators like Google News for listing snippets of articles on their websites. Spain has already passed such a law, leading Google to shut down its news service in the country. The European Commission will submit its proposals to update the copyright rules in September. Member of the European Parliament Julia Reda called the leaked draft of the proposal “another ACTA,” critiquing the proposed changes for putting corporate interests over those of creators, entrepreneurs and users. The Body of European Regulators of Electronic Communication finally published its revised guidelines that implement net neutrality in the European Union, concluding a three-year process of policy reform preventing discriminatory treatment of Internet traffic. Mahsa Alimardani, Ellery Roberts Biddle, Laura Vidal and Sarah Myers West contributed to this report.